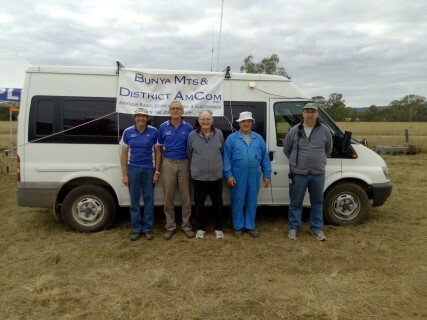 The Shack - Bunya Mountains and District AmCom Inc. 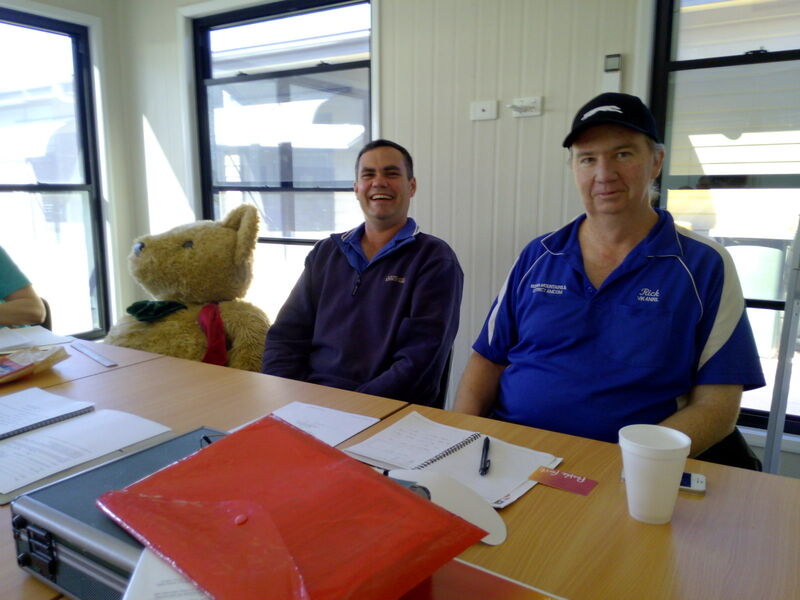 The meeting in Nanango was a great success. Our members from Dalby made the effort to come over the hill to the South Burnett. 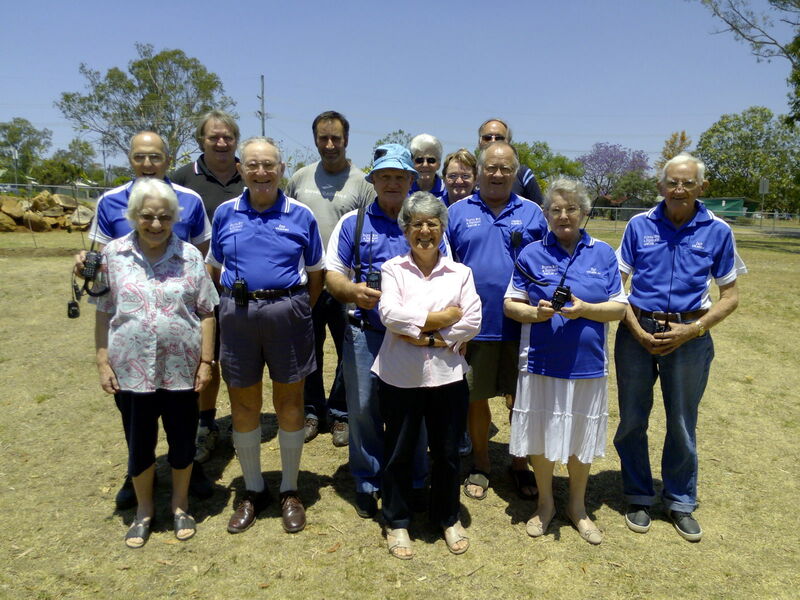 It was also great to see Rod (VK4ITT) coming all the way from Maryborough again, and also some locals showing up and show their support and interest in the club. The venue – the historic Ringsfield House – was fantastic. Thanks for Peter (VK4FGSD) and Andy (VK4TH) for organising yet another exciting meeting space. Thank you to the staff of the Ringsfield House to make our visit a pleasant one. Overall we had 16 members and guest participating. Minutes will be posted shortly. Our club recently made it to the WA news. 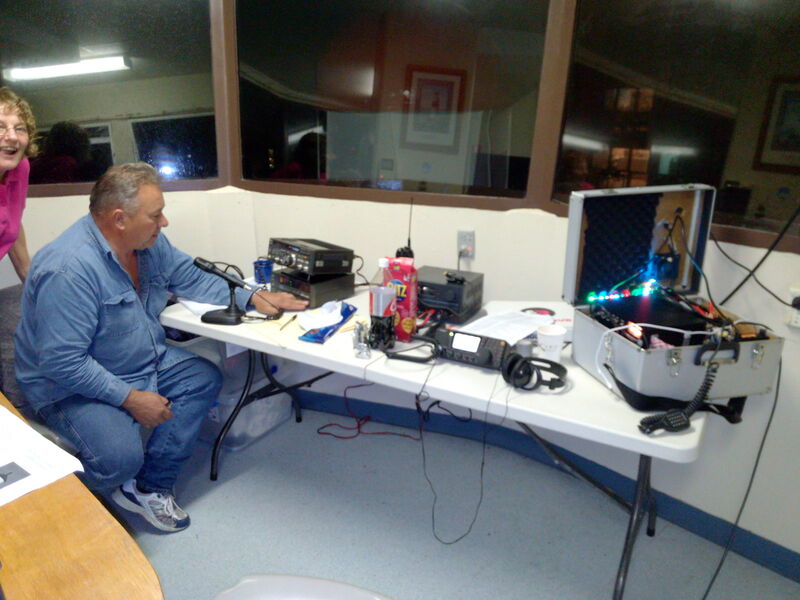 Listen to the broadcast here : NewsWest WA Amateur Radio News from April 29th 2018.. Jump to 18:20 in the audio file if you dont want to listen to the complete broadcast. Thank you Bob VK6POP for putting in the effort to call all clubs to submit their contribution. 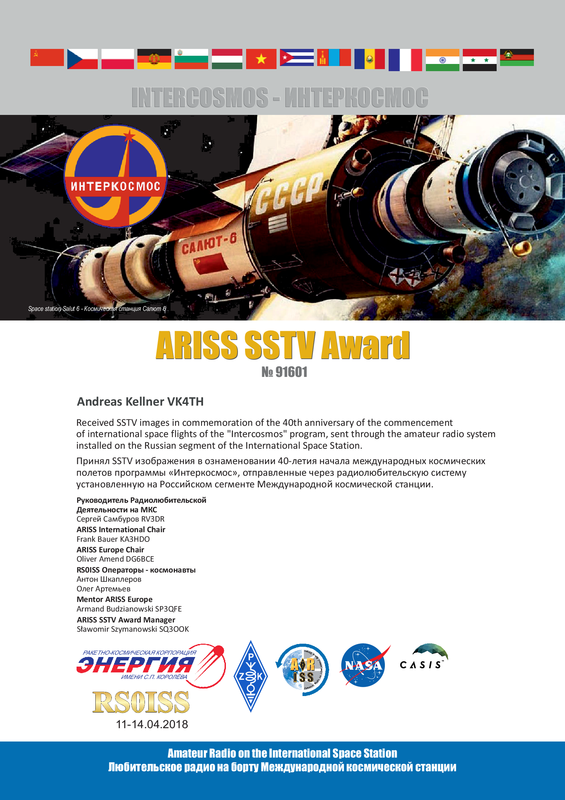 I recently won an award from ARISS (Amateur Radion on the International Space Station) for receiving and submitting SSTV images from the russian segment of the ISS (Zarya) during an experiment. Click on the image on the right for a higher resolution version. Please enjoy reading our latest newsletter : News in Brief Autum 2018 edition. If you are interested what has been discussed and decided at our meeting on February 3rd 2018, please read the meeting minutes. 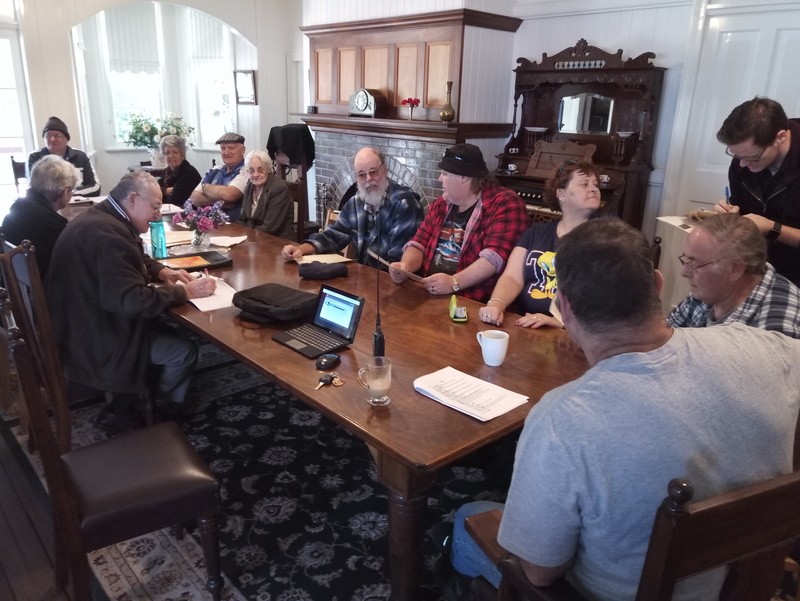 Our Editor-In-Chief and club secretary Neil (VK4NF) has been busy at it again and produced one of his very much loved and appreciated newsletters : News in Brief. This is also the last edition for 2017. Happy New Year, everybody ! 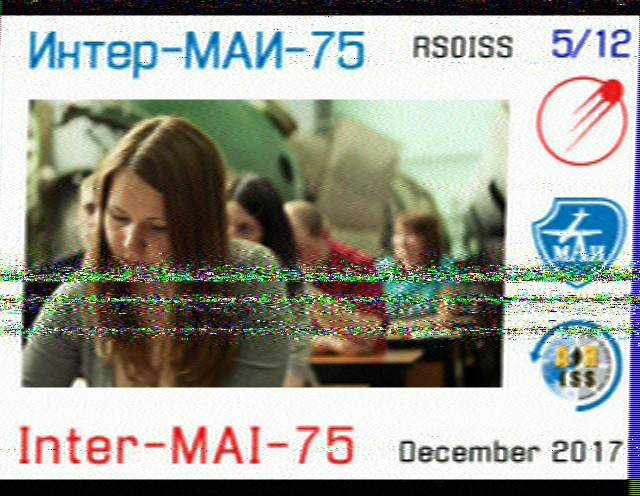 The Russian module ("Zanya", callsign: RS0ISS) recently setup a Kenwood TM-D710 and transmitted SSTV images for the Inter-MAI 75 experiment. I was able to capture some of those as the space station passed over Kingaroy. Enjoy. On November 11th 2017 at 21:16 AET the Italian school Liceo Statale "Ilaria Alpi", Rutigliano established contact with the International Space Station (NA1SS) via Telebridge to VK4KHZ. The Italian astronaut Paolo Nespoli, IZ0JPA answered questions from the students in his native language. I was able to listen into the downlink from the ISS as it passed overhead (21 degree pass over Kingaroy, QLD). You can listen to recorded audio clip from Paolo here. If you speak Italian maybe you can email us what he is actually saying ? My 'un po' Italian knowledge tells me that he is talking about the physical and psychological challenges/sensations of being in space (Paolo is 60 years old). Please use our Contact Page. ISS contacts audible over SE QLD ! For those of you who are interested: There are 2 contacts scheduled between the International Space Station (ISS) and schools in Italy. 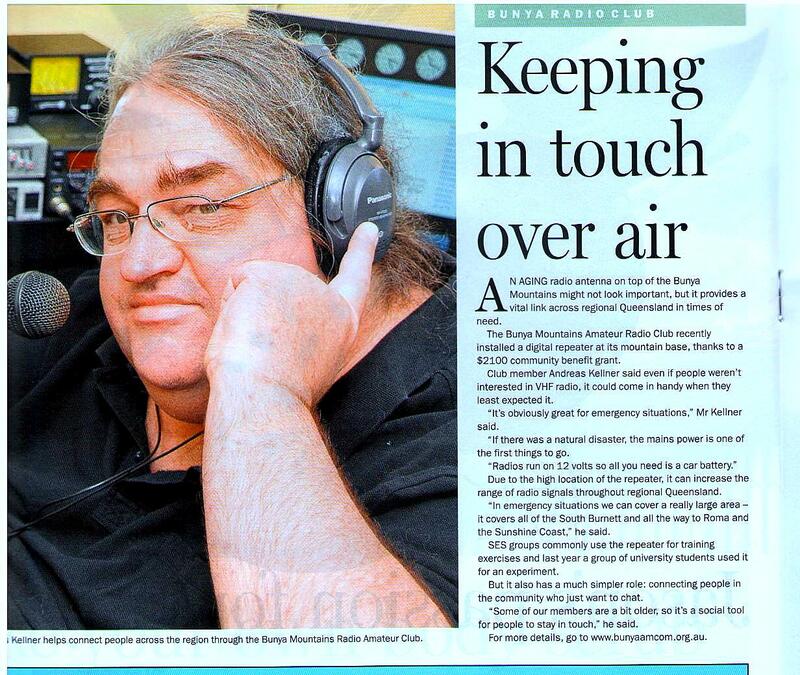 The actual contact will be made by VK4KHZ, which means the contact will be audible over SE QLD. The contacts are scheduled for: 11.11.2017 at 11:16 UTC and 14.11.2017 at 10:15 UTC. So tune in your 2 m radio to 145.800 Mhz. (ISS downlink frequency). 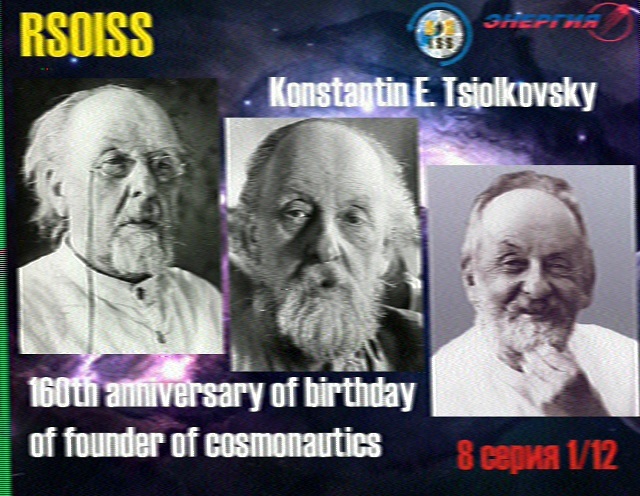 Apparently the contact will also be streamed on the HamTV website : https://ariss.batc.tv/hamtv/. If you are interested what has been discussed and decided at our meeting on November 5th 2017, please read the meeting minutes. 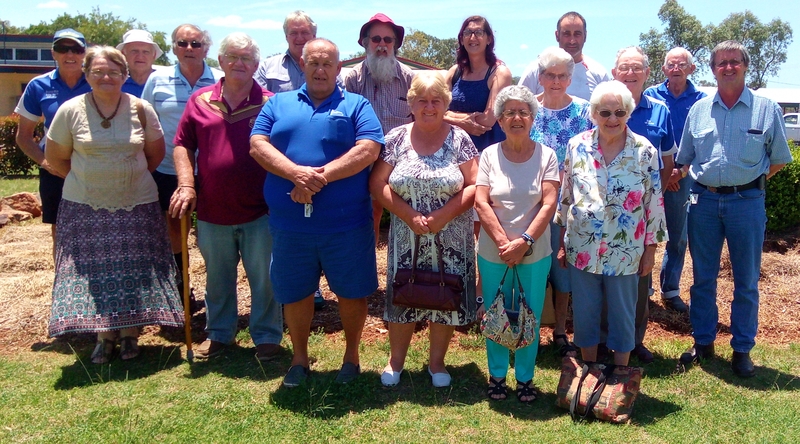 It was a great meeting with 22 members and guests present, and we had a very enjoyable lunch at the Nanango RSL afterwards. 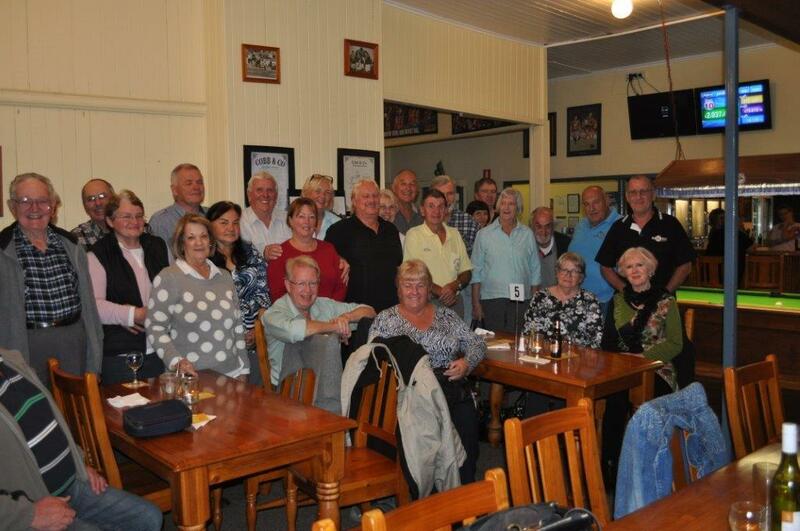 Some people traveled from far (Rod VK4ITT & YL from Maryborough). Thank you to everybody who made the effort to participate ! Please enjoy the spring edition of our Newsletter : News in Brief. Thank you Neil. On the weekend of September 9th and 10th our club attended once again to the Jandowae Trail Bike Ride. The event was a great success and we contributed greatly to the safety of the riders and organizers and supported all participants to have a good time. Saturday was a particular busy day with several injuries and break downs. 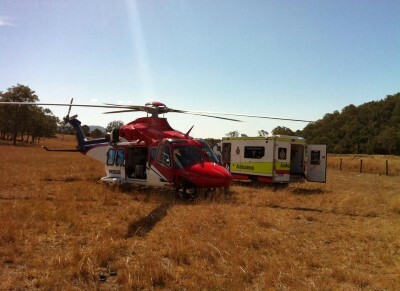 At one stage there were 2 ambulances and 3 injured riders, one of which required medical evacuation with the Rescue 500 Helicopter to Brisbane. This shows once more how essential it is to have good and reliable communication in this rugged wilderness. The South Burnett Times ran a nice article about the recent award. 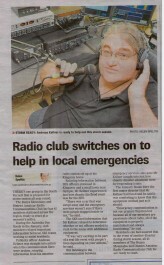 It talks about the Nanango State High School amateur radio station VK4NHS and establishing radio contact with the ISS. Read the article here. 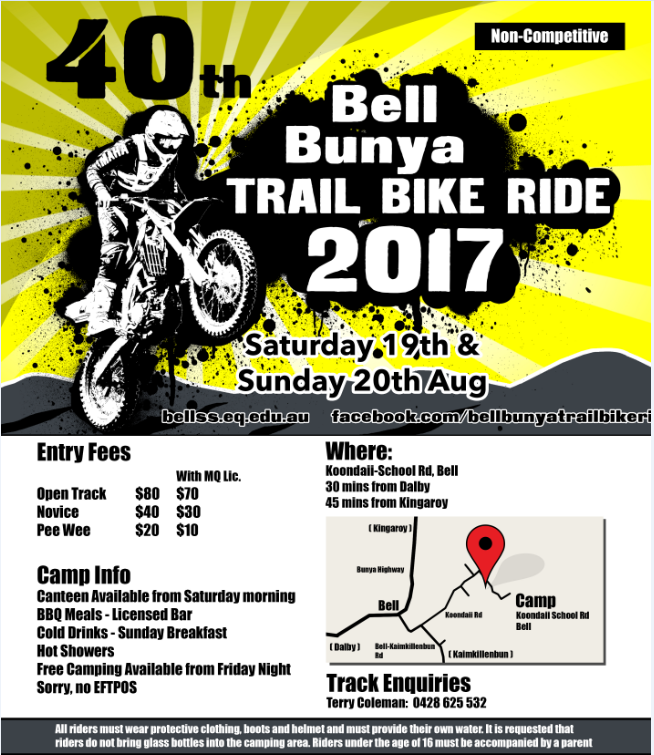 The Bunya Trail Bike Ride was carried out on the weekend of August 19th and 20th in the Bunya Mountains with the base located just outside Bell. Although freezing temperatures and gale force winds, our members faced the elements and provided communication services to the event thru-out the weekend, working closly with the origanisers, recovery services and emergency services on site. Job well done, everybody ! The minutes of the AGM and general meeting will be posted soon. Our very own Andreas Kellner - VK4TH won the prestigious 2017 Peter Doherty Award for Excellence in Science, Technology, Engineering and Mathematics (STEM), in part for establishing the amateur radio station at Nanango State High School - VK4NHS. 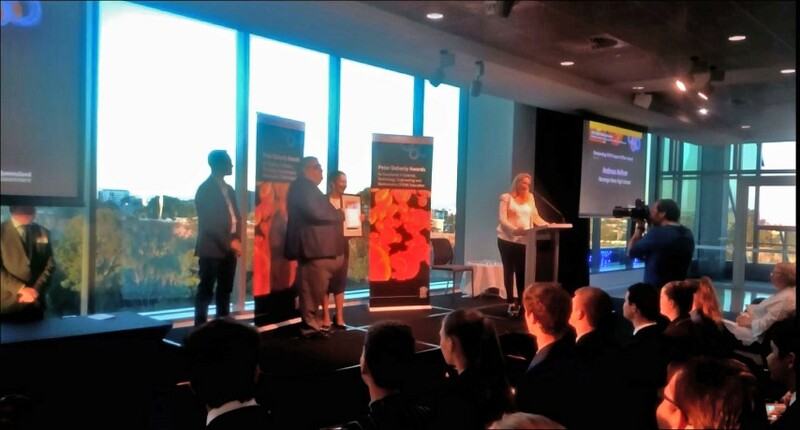 The award was presented to him by the honorable Kate Jones (MP), Minister for Education at the awards ceremony at the Queensland University of Technology in Brisbane. The award also comes with AU $ 5.000. That should buy him some new gear :-). Well done, Andreas. 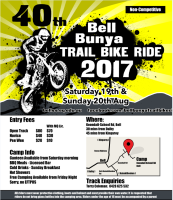 First up is the Bunya Mountains Trail Bike Ride. This event will be on the weekend of August 19th/20th 2017. 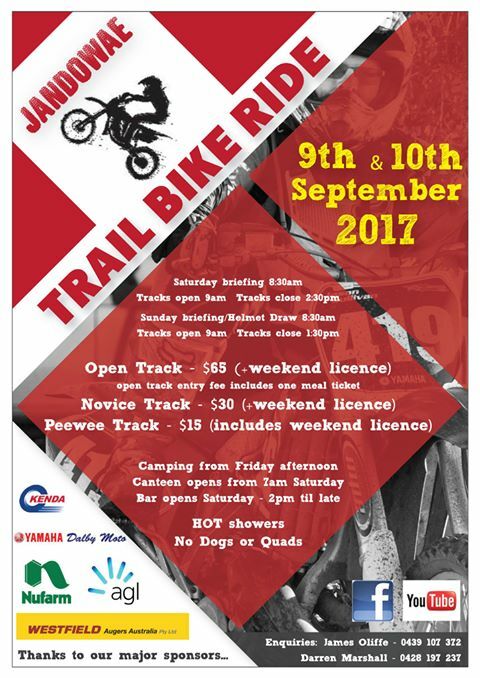 The second event is the Jandowae Trail Bike Ride.This event will be on September 9th and 10th. We need volunteers for both events ! 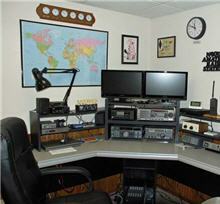 You need to have a current amateur radio license and some VHF gear - mobile prefered. If you have a mobile HF setup, thats a plus. We also need some 'support' personel which can run errands, track down people, monitor the radio etc. 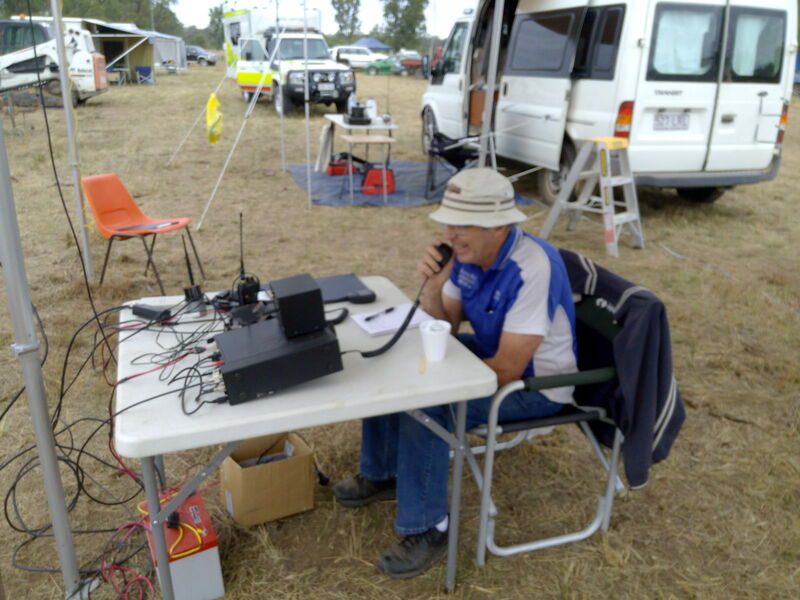 So please, if you are interested in a fun weekend in the field, please conact our secretary Neil - VK4NL. If you are interested what has been discussed and decided at our meeting on May 13th 2017, please read the meeting minutes. The next general meeting will be held on Saturday the 12th August 2017 starting at 1000 Hrs sharp. The venue will be the MYCNC facility Cnr of Drayton and Nicholson Streets In Dalby. We will have a cuppa on prior to the meeting, and the usual BBQ lunch to follow. We will be in the Webster room Provided we are not shunted by a paying tenant. All members are encouraged to attend, and we welcome any visitors to come and join us. Please download the newsletter, Autum 2017 edition here. We now have a page which lists all the meeting minutes and News in Brief Newsletters (well the ones I have anyways). If you are interested in some historic reading, head over here. Note this page can also be reached over the Activities page. If you are interested what has been discussed and decided at our meeting on February 2nd 2017, please read the meeting minutes. 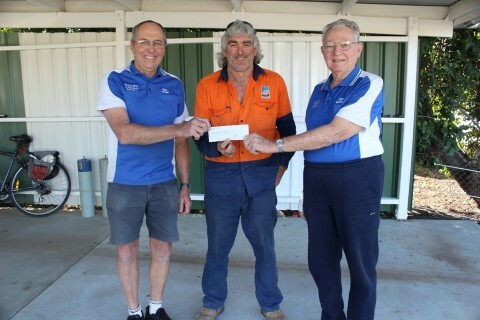 Today, the club received a very generous donation from the Jandowae Trail Bike Ride Association, which is founded and lead by president Darren Marshall. 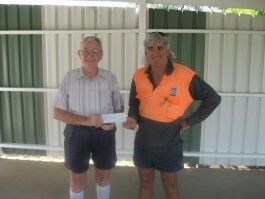 Darren personally delivered a cheque today to the clubs president Reg Kerslake for the sum of AU $ 750.- (pictured). He thanked our club for helping out with communications during last year’s bike ride in Diamondy, near Jandowae. Our club says "Thanks a lot" for the donation which helps us a lot for maintaining and purchasing new equipment, so next year we can serve the riders even better. Please download the newsletter, Summer 2017 edition here. If you are interested what has been discussed and decided at our meeting on October 29th 2016, please read the meeting minutes. Jandowae trail bike ride .. Well done ! On the weekend of 9th to 11th of September 2016 the Bunya Mountains and Distric Amateur Radio Club Inc. once again provided communication services to the Jandowae trail bike ride. Due to personal commitments of many members we where short staffed, but still managed to man all 4 outposts and the base to coordinate rescue and recovery activities. The weekend was a great success and the organisers where very happy with the outcome. Well done: Peter (VK4POP), John (VK4TJ), Doug (VK4AMC), Allan (VK4MBE) and Andy (VK4TH) for spending your personal time and money to make this event a great success ! 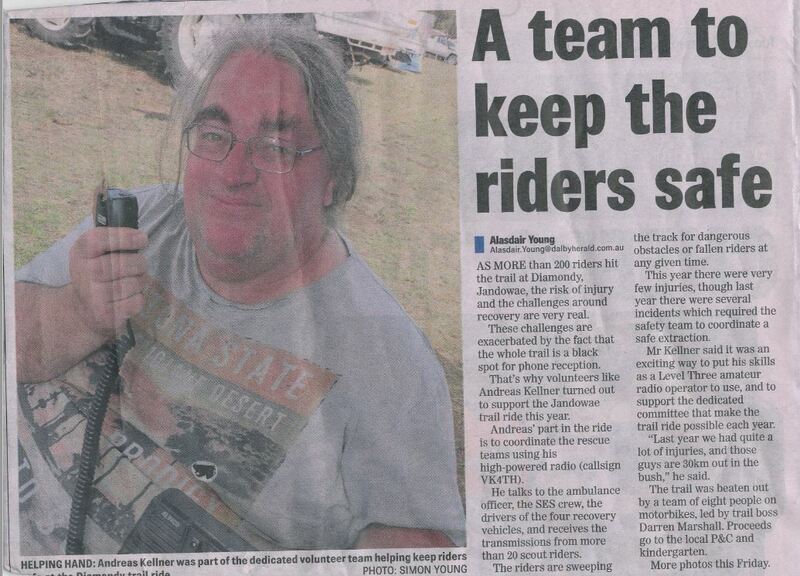 On Tuesday, September 13th 2016 the Dalby Herald ran a page 2 story about us helping out at the Jandowae trail bike ride. 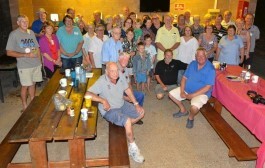 On August 6th we've held our annual AGM in Dalby. Thank you for all who made the effort to show up - even all the way from Tasmania ! 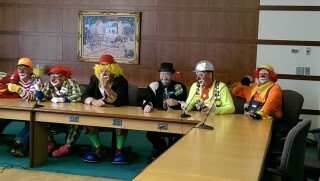 Congrats to the new executive team. If you are interested in the details, please download the meeting minutes here and here (general meeting held at the same day). Survey Results are in ! Last month we contacted our club members and many non-members, asking to take a short online survey. The results are in and have been presented at the AGM 2016. For those of you who couldn't make it, please download the results here. Interesting feedback and thanks to all who participated. As always, if you have any comments of questions, please use the Contact Us page. 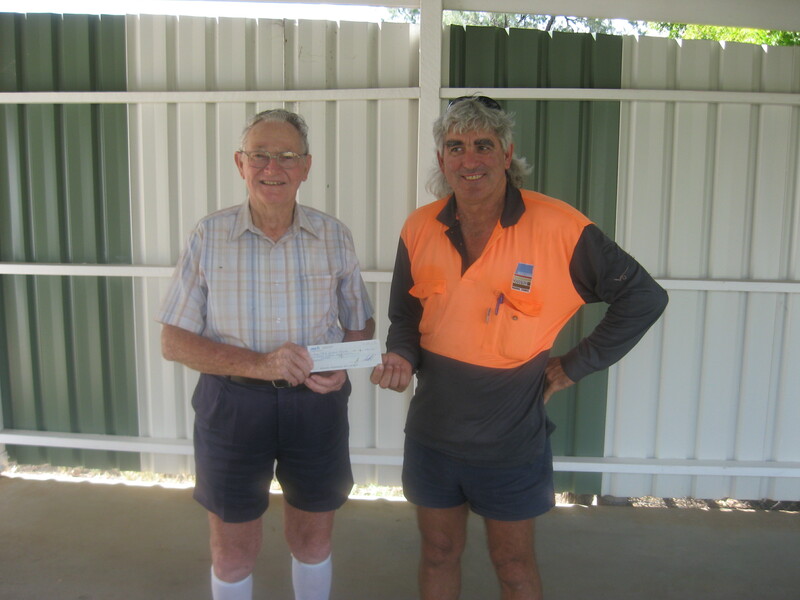 The Kingaroy repeater receives great support and the project is currently underway. Right now we are clearing administrative and legal hurdles. Stay tuned for updates. 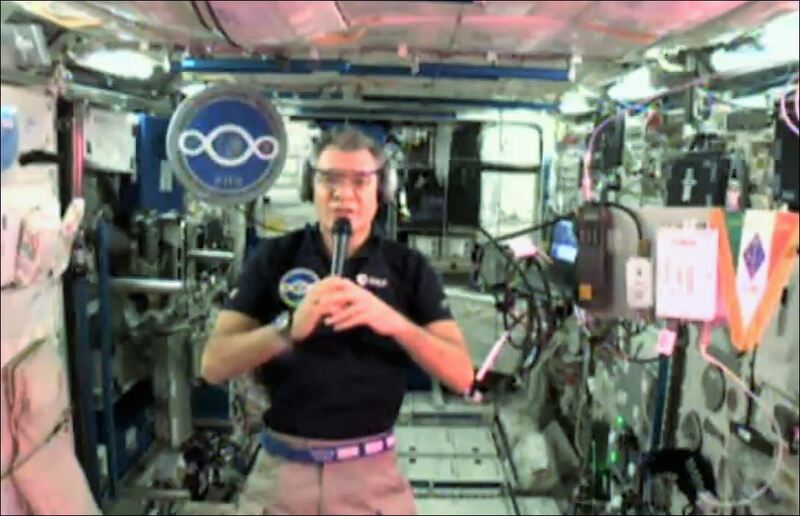 Live Crew Audio from the International Space Station ! 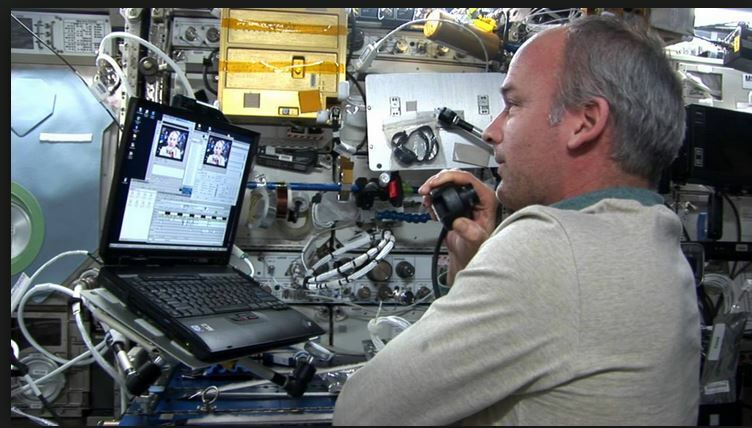 On May 20th 2016 at 18:30 AET the Essex Heights Primary School, Mount Waverley, Victoria established contact with the International Space Station (NA1SS) via Telebridge to VK5ZAI. American Astronaut Jeff Williams (KD5TVQ) onboard the ISS answered 22 questions from students. Although only a 19 degree pass over SE-QLD, I was able to catch most of the audio directly from the ISS on 145.80 Mhz FM as it passed over the east coast, using my very humble homebrew satellite antenna system. 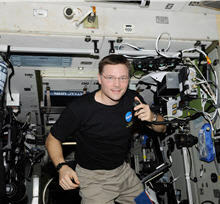 Listen here to a recording taken from my FT 847, Jeff talking about the danger of space-junk to the ISS. Our latest club newsletter is available for your reading pleasure here. 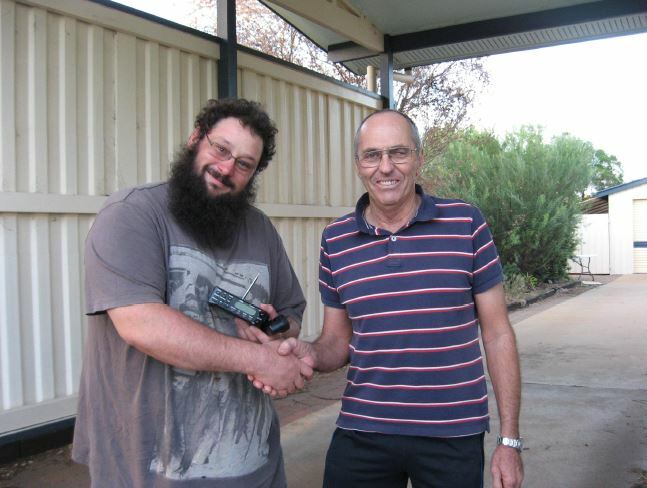 Congratulations to Daniel VK4FSYR for winning the first price, a Uniden BC 350 A scanner (donated by Andy VK4TH) at our Yallakool camp raffle ! Noel's Nutty Campers where out and about again. 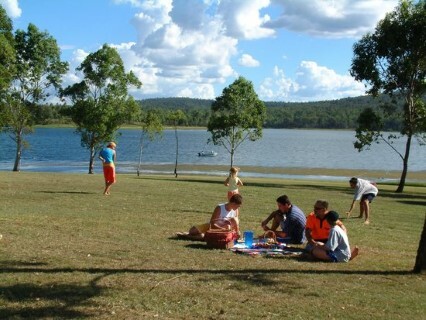 This time they all gathered in the beautiful South Burnett at Yallakool Carvan Park at Lake Barambah, near Murgon. The weather was fantastic over the long weekend and many 'Happy Hours' sure created lots of laughs and surprises (and some hangovers the next day). On Saturday everybody descended on Moffetdale Ridge Winery (try their late harvest Verdeloh !) for an afternoon of wine-tasting (expertly and humorously narrated by the co-owner Jason), followed by a delicious roast lunch and desert. Afterwards a boot sale was held and the afternoon finished with a raffle, organised by our club with 15 great prices won. Well done Noel and Thank you for another great experience. We are looking forward to the next one. On Wednesday, April 20th 2016 an article about the Bunya Mountains Amateur Radio Club, Inc. got published in the Kingaroy Mail. Click on the picture for a high-res version. An no, the journalist did not ask me if he can use this picture. The minutes from our last meeting are now online and can be downloaded here. Please check out this newspaper article (click on it for a larger version) about our repeater upgrade on the Bunya Mountains. This article was posted in the Dalby Herald on the 5th of January 2016. Many thanks to our club secretary Neil Holmes VK4NF for getting it all organised. We are proud to announce our club camp in April 2016 ! Traditionally this camp has been help in Kirkleigh/Summerset Dam, we have decided to move it to a different location in 2016. Also watch out for Noels broadcast emails with booking sheets. Please try to book as early as you can, as this is also Anzac day weekend, and the place will be very busy. We are planning a meal at the Murgon RSL as well as a visit to a local winery. It will be fun, so dont miss out ! For info about past and future events, please visit Nutty Campers website. We are currently trialing a new club net. The new net is on the 2 m repeater VK4RET, 146.675 Mhz, negative offset, 91.5 Hz access tone. The net commences every Wednesday night at 07:30 pm AET. We trial this net for the next 4 weeks, and if there is enough participation and interest, continue it next year. So stop by and say hello (and yes the repeater is working fine). The meeting on November 14th was a successful one, and the discussions where both fruitfull and pleasant. A excellent BBQ lunch was prepared afterwards and all YL's provided some great deserts which have been enjoyed by everybody. A lack of participation was noted and it was quite disappointing that many members don't even put in an appology these days. Find out what has been decided by downloading the meeting minutes here. The October gathering from Noel's Nutty Campers crew was certainly very enjoyable for everyone ! This time the crowed decended on the sleepy coastal town of Poona Bay, just north of Rainbow Beach. Although a smaller crowd, we had great fun with a fantastic meal on Friday night from the friendly locals, and a nice relaxed sausage sizzle on Saturday, which has been put up for us from the campground ownwers. Of course, Noel was fireing on all cylinders with plenty of prices to be had food and some booze thruout! Well done everybody and I am looking forward to see you all at the 'big one' in April 2016 at Lake Bahambra. After a brief well earned rest period from our editor-in-chief Neil VK4NF, here comes a new version of the ever popular News in Brief, with lots of updates whats happening with the club, the repeater etc. Please download your copy here. Many thanks to all who have contributed ! The move to the new web hosting company has been completed. You should see an increase in loading speed and no more annoying advert pop-ups ! Thanks for you patience during the construction. Congratulations to all new executives ! Jandowae Trial Bike Ride: Great Success ! On the weekend of 03-05.07.2015 the club helped out at the Jaendowae trial bike event. About 400 people camped out on a paddock nearby Jaendowae, and riders of all ages could test their skills from junior and novice tracks, to the more challenging 50 km open rider track thru quarries, woods, hillclimbs and creeks. The club provided communations with a HF and VHF base station, a mobile UHF repeater and 3 VHF/HF field stations with UHF CB gateways. Medical attention and vehicle recovery was coordinated with the origanizers based on the information relayed from the field stations. Both days where quite busy, and the communication to the medical staff, 'sweepers' and recovery vehicles has been vital. The organizers where very impressed with the smooth and fault-less operation of the communication network, and already invited us back next year. A very successfull weekend, with plenty of action and fun to be had (even with some chilling temperatures during the night); a great team effort from: Neil (VK4NF) & YL, Rick (VK4NRL), Reg (VK4AQU) & YL, Peter (VK4POP), Andy (VK4TH) and very special thanks to John (VK4TJ) from Murphys Creek. Thanks also to Ian who helped with the setup on Friday. Well done, team ! Check out the pictures at the gallery page. 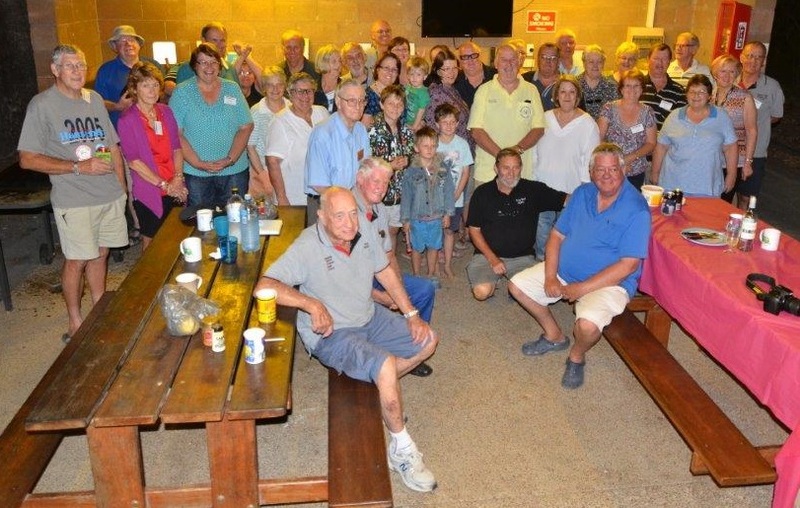 On the weekend of May 28th to June 1st Noels Nutty Campers decendet on the Woolshed in Jondaryan. 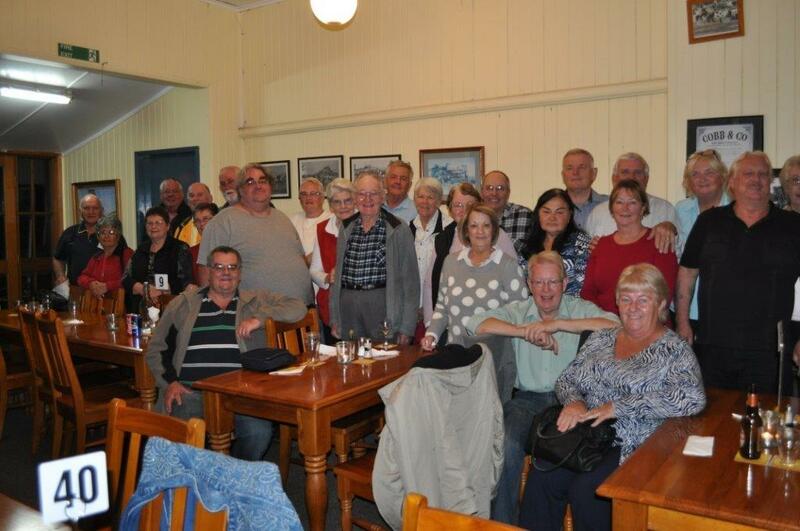 It was another very successfull and enjoyable camp, with 38 "Nutty Ones" at the Saturday night dinner. Great to see old friends and make some new ones. Well done Noel, and we are looking forward to the next one. IRLP and Echolink are currently unavailable. APRS digipeater is active on 145.175 Mhz. Many planned activites in fall / winter ! Phew, this was a busy meeting with lots of things happening. Peter and Neil are very busy moving forward on the new new repeater installation with top quality gear purchased from overseas, which hopefully will get rid of the interference problems. Next event is the Trial Bike ride at Jandowae on the weekend of July 4th and 5th. We have been asked to provide communication for the event, and are more than happy to comply. We will have a site survey mid May with a full setup radio test on June 13th. 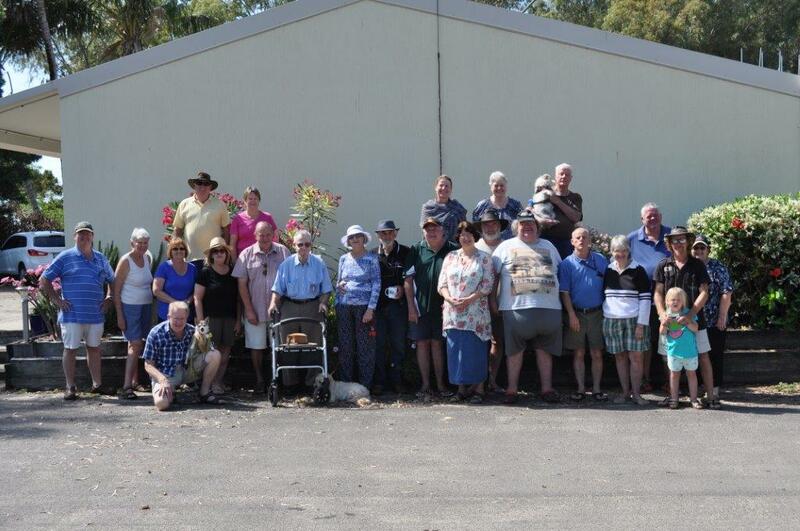 On November 1st 2014 the club held its quarterly meeting at the Nanango State High School. It was a beautiful sunny and hot day and the air condition int the meeting room was much appreciated. Great to see a good turnout from the Dalby people to do the travel to this side of the mountain and also give the opportunity to some SB residents to attend, which otherwise won't or can't travel to Dalby. There where many things to discuss and you can download the meeting minutes here. 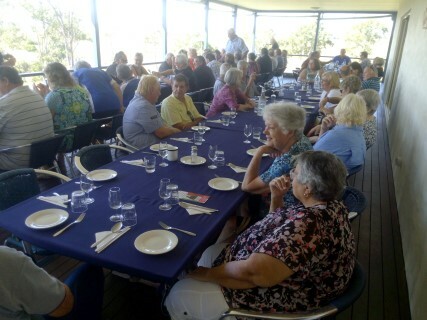 After the meeting the club members relaxed over a good lunch and a cold one at the Nanango RSL. Thank you to Nanango State High School to provide the great venue. of 40 + 'Nutty Ones' with the main event being the Saturday Night BBQ. Andy - VK4TH represented our club and we all had a great time. Thank you Noel - VK4NL for all the hard work you put into organizing these events. Well done, and we are looking forward to the next one. Visit the visit the Nutty Campers Website for more info and future dates. Check out the Gallery Page for the latest fotos (made with mobile phone only). There will be no Christmas breakup this year. Click here to download the minutes from the August meeting. Click here to download the minutes from the 2014 AGM. The 2m repeater VK4RED on 147.250 Mhz. is currently installed in Dalby. Kirkleigh camp 2015 is a go and will be held on 27th - 29th of March 2015. Ricky - VK4NRL is organizing this event. There will be no more foundaition license courses this year. Dates for 2015 to be announced. 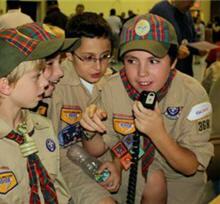 The Scouts Jamboree on the air weekend is coming up on October 17th - 19th 2014. If you are interested or would like to assist in this years activities, please contact Morris (VK4FMLV) : 07 4662 1151 or email: morrisvickery@hotmail.com. Our club made it once again into the newspapers. 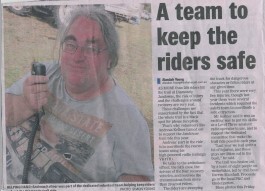 This time an article appeared in the local Dalby newspaper, about the fundraising efforts of the club. Read all the glory details, by clicking on the image to your right ! 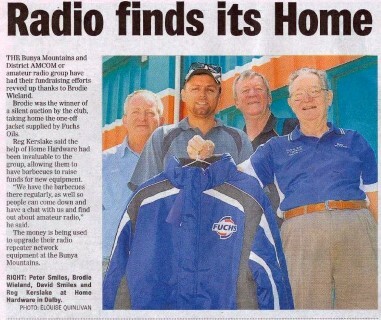 Well done crew and thank you very much Kerry Black - VK4FKDB for donating the fantastic Fuchs Oil jacket to the club. Thank you Home Hardware for letting us set up shop there for our sausage sizzles. The 2 m repeater is on the air again on its usual frequency 146.675 Mhz. (neg offset) and the 91.5 Hz. access tone ! 80 m Net Controllers: August: Ricky VK4NRL, September: Andy VK4TH, October: Ian VK4NVF. The net is on every Sunday night at 19:30 AET on 3.650 Mhz. LSB. John Moyle Fieldday 2015: 21/22 March 2015. Jondaryan Woolshed. Vice-President: Kerry Black - VK4FKDB. Acequickfit@westnet.com.au Update: Kerry has resigned. Thank you outgoing executive team ! A big "Thank You" on behalf of all members from the Bunya Mountains and District AmCom Inc. to our outgoing Executives: Neil Holmes VK4NF (left, sleeping), Rick Lloyd-Jones VK4FRLJ (middle) and Rick Lammas VK4NRL (right). Thank you for a fantastic year of leadership. Job well done ! Yet another fantastic edition of the always popular News in Brief by Neil (VK4NF) Check it out here. 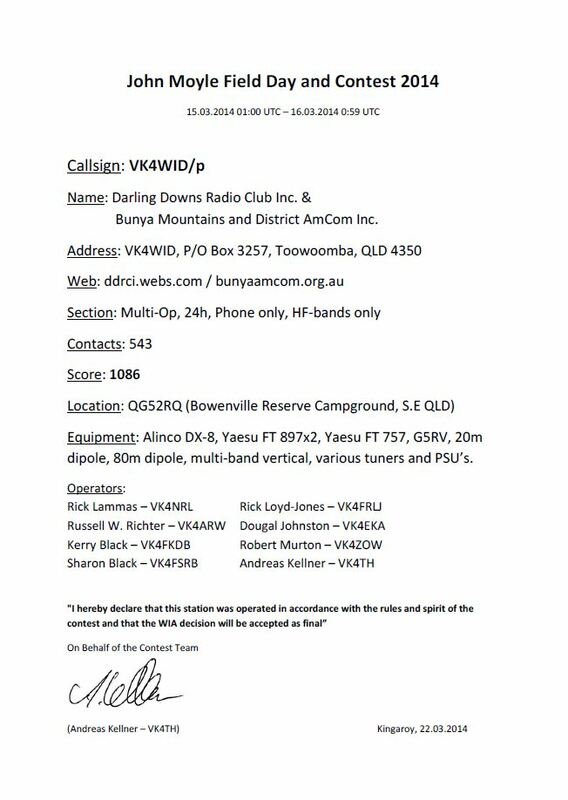 Just letting you all know that the club's 2mt repeater VK4RED (formally operating in Dalby) is now back on air, now located on Karingal hill about 15 klms north of Dalby off the Dalby Jandowae road. Please note the TX frequency is now 147.250 Mhz. and RX is 147.850 Mhz. no tone access is required. so, dial up 147.250mhz on your trusty radio with a +600kkz offset and you will be up and running. in the contest in the 24h/portable/multi-operator/HF band only category. Number 2 in Queensland. Well done VK4QD for winning this years contest with a score of 2606 points. Interesting note: If we would have submitted our logs in the 24h/portable/multi-operator/all bands category, we would have won ! You can download the official results from the WIA website here. Our all time favorite editor-in-chief and club secretary Neil (VK4NF) has completed yet another fantastic edition of the News In Brief. Thanks Neil for your hard work ! Check it out here. The worlds largest amateur radio tower, OH8X's 40 ton tower best known for its 3 element 160m yagi, has collapsed during a storm on December 5th. 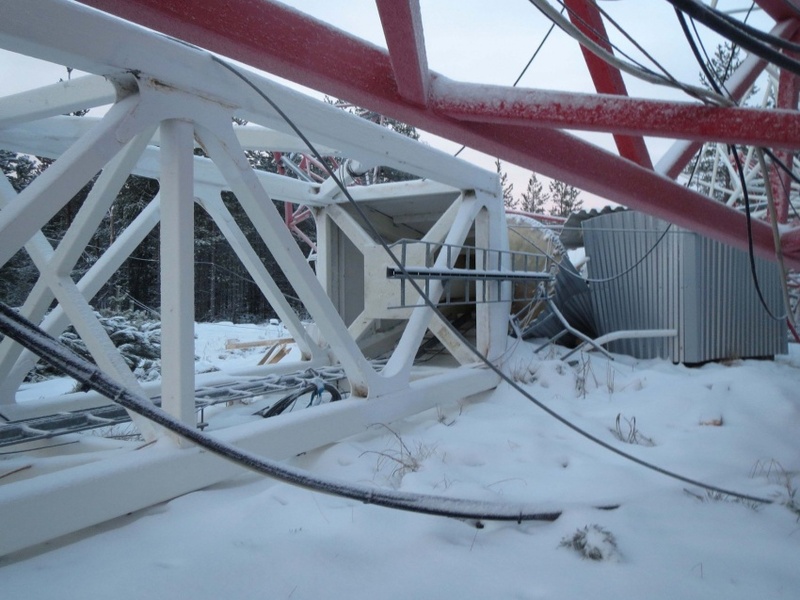 The 100 m tower came down as apparently the mechanism which turns the antenna into the wind during storms failed, exposing the tower to unusual high torque loads. Nobody was insured and no other equipment was damaged. Tokyo Hy-Power files for bankruptcy. Tokyo Hy-Power, trusted manufacturer of linear amplifiers, filed for bankruptcy protection on December 26th 2013. Apparently phones are no longer answered, and their japanese website is taken offline. It is unclear at this stage what that means for their service network, but dealers in the U.S. sell their remaining stock now without any warranty. 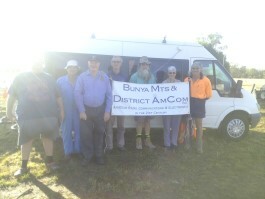 Bunya Mountains and District AmCom in the News ! Recently, the South Burnett Times ran a story on our club in the local newspaper, featureing yours truely Andreas Kellner - VK4TH. And although the journalist used a bit of 'creative writing' in the story, it is great to create some visibility for the club in the local community. Unfortunatelly she did not include the link to the website in the article. Click on the image to your right, to download a high resolution scan of the story, as it was in the South Burnett Times from Tuesday, 05.11.2013, Page 4. If you are interested about the happenings of our last meeting in Kingaroy, download the meeting minutes here. 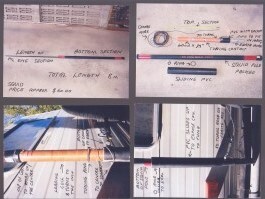 Build your own squid - pole antenna ! Reg, VK4AQU, has kindely provided us with some instructions on how to build your own squid pole antenna ! He took some detailed photographs of his, together with some written instructions. In my understanding this antenna can be tuned for all HF bands and is ideal in a portable / camping setting. Please download the instructions by clicking here. Here you find the latest news and information about the club. Skeds, Nets, Skips, Newsletters, Classifieds and many bits and pieces in The Shack. Who are we and what do we do ? From our regular scheduled nets on HF and 2 m, to meetings, camps and the scouts jamborre. Find something you like and join. What do you need to get on the air ? 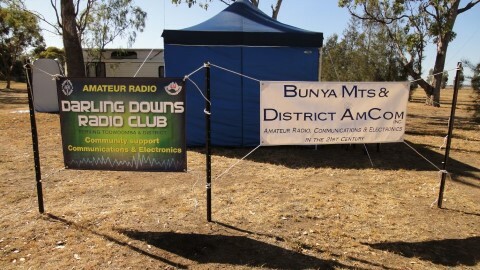 See some of our members shacks and antennas, as well as our famous 2m / 70 cm Bunya mountain repeater. 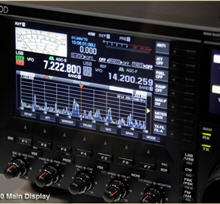 RTTY, STTY, JT65, BSPK31 ... what is this all about and why you should care. 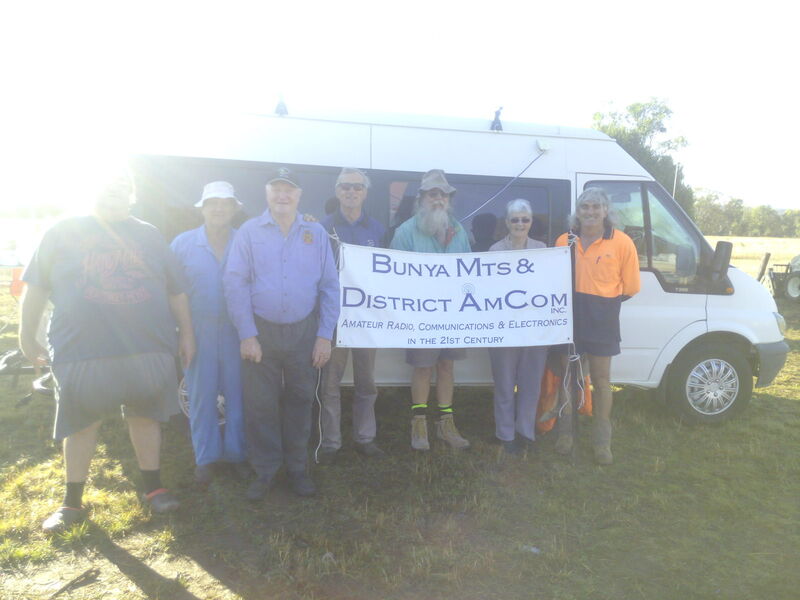 © Copyright © 2016 Bunya Mountains and District AmCom Inc .